You are currently browsing the tag archive for the ‘tom’ tag. Naturally he wondered where the stone might be, and he looked again, and there by the hedge bottom was a great flat stone, nigh buried in the mools, and hid in the cotted grass and weeds. One of the stones was called the ‘Strangers’ Table’. However, down he fell on his knee-bones by that stone, and hearkened again. Clearer than ever, but tired and spent with greeting came the little sobbing voice — ‘Ooh! ooh! the stone, the stone on top.’ He was gey, and misliking to meddle with the thing, but he couldn’t stand the whimpering babby, and he tore like mad at the stone, till he felt it lifting from the mools, and all at once it came with a sough out o’ the damp earth and the tangled grass and growing things. And there in the hole lay a tiddy thing on its back, blinking up at the moon and at him. ‘Twas no bigger than a year-old baby, but it had long cotted hair and beard, twisted round and round its body so that you couldn’t see its clothes; and the hair was all yaller and shining and silky, like a bairn’s; but the face of it was old and as if ’twere hundreds of years since ’twas young and smooth. 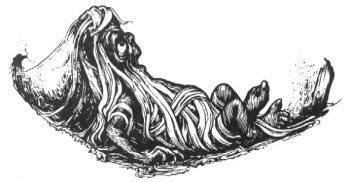 Just a heap of wrinkles, and two bright black eyne in the midst, set in a lot of shining yaller hair; and the skin was the colour of the fresh-turned earth in the spring — brown as brown could be, and its bare hands and feet were brown like the face of it. The greeting had stopped, but the tears were standing on its cheek, and the tiddy thing looked mazed like in the moonshine and the night air. The creature’s eyne got used like to the moonlight, and presently he looked up in Tom’s face as bold as ever was; ‘Tom,’ says he, ‘thou’rt a good lad!’ as cool as thou can think, says he, ‘Tom, thou’rt a good lad!’ and his voice was soft and high and piping like a little bird twittering. ‘Thankee, master,’ says Tom, quite meek like. ‘Stop,’ says he, quick as lightning. ‘I’ll help thee and welcome, but if ever thou sayest that to me — if ever thou thankest me, see’st thou, thou’lt never see me more. Mind that now; I want no thanks, I’ll have no thanks’; and he stampt his tiddy foot on the earth and looked as wicked as a raging bull. ‘Mind that now, great lump that thou be,’ he went on, calming down a bit, ‘and if ever thou need’st help, or get’st into trouble, call on me and just say, “Yallery Brown, come from the mools, I want thee!” and I’ll be wi’ thee at once; and now,’ says he, picking a dandelion puff, ‘good night to thee’, and he blowed it up, and it all came into Tom’s eyne and ears. Soon as Tom could see again the tiddy creature was gone, and but for the stone on end and the hole at his feet, he’d have thought he’d been dreaming. Well, Tom went home and to bed; and by the morning he’d nigh forgot all about it. But when he went to the work, there was none to do! All was done already, the horses seen to, the stables cleaned out, everything in its proper place, and he’d nothing to do but sit with his hands in his pockets. And so it went on day after day, all the work done by Yallery Brown, and better done, too, than he could have done it himself. And if the master gave him more work, he sat down, and the work did itself, the singeing irons, or the broom, or what not, set to, and with ne’er a hand put to it would get through in no time. For he never saw Yallery Brown in daylight; only in the darklins he saw him hopping about, like a Will-o-th’-wyke without his lanthorn. At first ’twas mighty fine for Tom; he’d naught to do and good pay for it; but by and by things began to grow vicey-varsy. If the work was done for Tom, ’twas undone for the other lads; if his buckets were filled, theirs were upset; if his tools were sharpened, theirs were blunted and spoiled; if his horses were clean as daisies, theirs were splashed with muck, and so on; day in and day out, ’twas the same. And the lads saw Yallery Brown flitting about o’ nights, and they saw the things working without hands o’ days, and they saw that Tom’s work was done for him, and theirs undone for them; and naturally they began to look shy on him, and they wouldn’t speak or come nigh him, and they carried tales to the master and so things went from bad to worse. For Tom could do nothing himself; the brooms wouldn’t stay in his hand, the plough ran away from him, the hoe kept out of his grip. He thought that he’d do his own work after all, so that Yallery Brown would leave him and his neighbours alone. But he couldn’t — true as death he couldn’t. He could only sit by and look on, and have the cold shoulder turned on him, while the unnatural thing was meddling with the others, and working for him. You’ll scarce believe it, but he’d hardly brought out the words but he felt something tweaking his leg behind, while he jumped with the smart of it; and soon as he looked down, there was the tiddy thing, with his shining hair, and wrinkled face, and wicked glinting black eyne. Tom could never rightly mind what he said next. ‘Twas all cussing and calling down misfortune on him; but he was so mazed in fright that he could only stand there shaking all over, and staring down at the horrid thing; and if he’d gone on long, Tom would have tumbled down in a fit. But by and by, his yaller shining hair rose up in the air, and wrapt itself round him till he looked for all the world like a great dandelion puff; and it floated away on the wind over the wall and out o’ sight, with a parting skirl of wicked voice and sneering laugh. A percentage of the profits from the sale of this book will be donated to the Prince’s Trust.